The 2018 ADAPT program participants live across the United States. The 29 members who took part in the RENEW program helped us with the crucial task of regenerating our collection. These 29 members grew 41 varieties for fresh seed that will both ensure the survival of these varieties in our seed bank for decades to come and make them available to the public through our seed Exchange. These efforts go to the heart of our mission at Seed Savers Exchange. Participants in the ADAPT program gave us invaluable feedback on 14 varieties from our collection that were selected for ADAPT because of their interesting and unique qualities. These varieties were grown by participants from 31 different states across USDA hardiness zones 4-9. ADAPT participants sent us feedback on the varieties through an online survey for traits such as vigor, productivity, and flavor. Participants also gave each variety an overall score and noted whether or not they would grow the variety again. Insights into some of the varieties grown by ADAPT participants follow. All of the varieties are available through the Exchange. 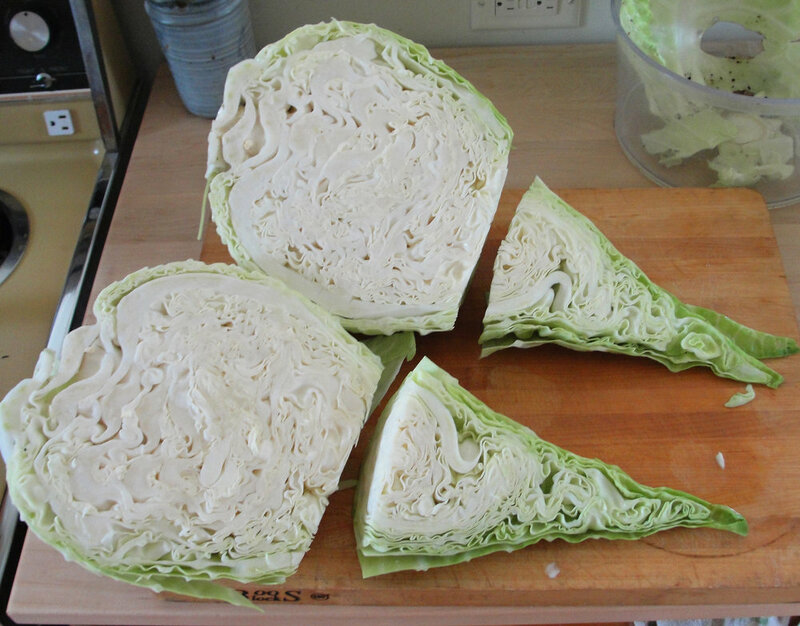 ‘Filderkraut’ cabbage, grown by Bjorn Bergman. A favorite of many, ‘Filderkraut’ is undeniably a charismatic cabbage. It is late to mature and requires up to three times the amount of space of other cabbages—but patience pays off. Its huge, stunning heads are best described by Patricia Eller of Washington State: “I loved this cabbage! The cone shape was really a conversation piece. It was awesome to watch it get bigger and bigger!” Bjorn Bergman of Wisconsin had good advice for growers: “This is a very long-season cabbage that is similar in maturing time to Brussels sprouts. Next season I would plant them the same time that I plant Brussels sprouts so they mature later in the fall for late-season kraut-making.” In fact, this cabbage takes so long to mature that one participant thought it was a leaf cabbage and gave up on it before it started forming a head. Most agreed that ‘Filderkraut’ was exceptional for ferments, with one saying that it provided lots of liquid for covering. Seven of eight growers said they would grow this variety again. ‘German Extreme Dwarf Bush’ tomatoes, grown by Liz and Talus Piatkowski. There is a tomato for every occasion, and even though the majority of growers did not think highly of ‘German Extreme Dwarf Bush,’ it still had its cheerleaders. Debi Bonkoski summed it up for most by saying, “This variety seemed to struggle in the garden.” The culprits ranged widely from thrips (Howard Nemerov of Texas), to wilt (Tim Noyes of Florida), to septoria (Kathleen Davidson of Illinois). Despite this, the tomato did have some redeeming qualities. Its short stature and early maturity make it a good choice for container gardening. 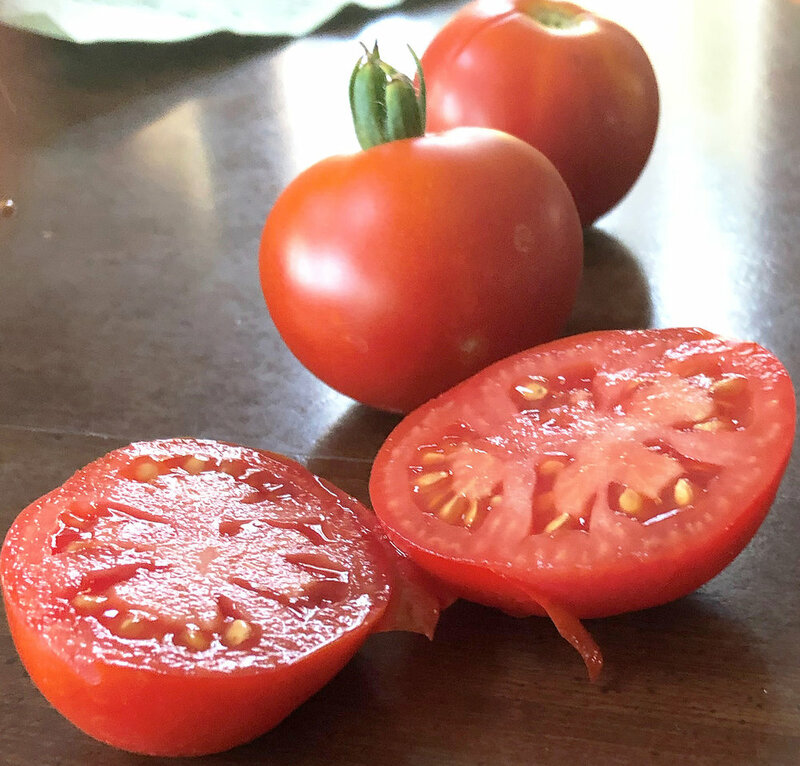 As for all-important flavor, Tim Noyes was calculated in his description: “Definitely not going to win any awards, but a good early tomato.” Most others were similarly half-hearted in their praise of its flavor. Rarely is there consensus like there was around the quality of ‘Poole’s’ okra. All four growers would recommend the variety to others and regrow it themselves. Jake Weakley of Missouri said that it became his favorite variety: “I really enjoyed the flavor much more than ‘Clemson’ okra.” Others praised it for its tremendous production and long pods that “stayed tender even when they were 4 -5" long,” according to Patricia Eller of Washington State. We at Seed Savers Exchange happen to agree. ‘Gropp Pie Melon,’ grown at Seed Savers Exchange in Decorah. Perhaps unsurprisingly, most of the 13 participants who grew ‘Self-Seeding’ lettuce found that it was quick to emerge and quick to bolt. All grew this as a spring crop, but more than a few people, including Sondra Raines Brooks of North Carolina, remarked that they would like to try it as a fall crop, suspecting it may not bolt as quickly then. Even before it bolted, the leaves were a bit rough and the flavor too bitter for Michael Cole of Wisconsin. Several growers expressed interest in its flowering genetics, and Kathleen Davidson was impressed with how quickly the seed heads went from closed to “open like a dandelion” compared to other varieties. One could conclude that if you want a low-maintenance lettuce and grow many successions throughout the season, ‘Self-Seeding’ might be the one for you. Or your chickens. Want to participate in 2019? We’re already looking forward to working with the 2019 Citizen Science Corps participants—and we hope that includes you! Are you an experienced seed saver? Then sign up for the RENEW program and help us regenerate rare varieties from the collection through the RENEW program. The ADAPT program, suitable for gardeners of all levels, will have a new, exciting focus in 2019—we are asking participants to help us decide which collection varieties deserve a place in our seed catalog! We’ll solicit feedback on some of our favorites from the last decade to see how popular they are with you and then take the best of the best and put them where they deserve to be—in our catalog. If you are a member of Seed Savers Exchange and want to participate in either the ADAPT or RENEW program in 2019, please contact Steffen Mirsky at sciencecorps@seedsavers.org. If you are not yet a member, join us for the opportunity to take part in the vital work of the Citizen Science Corps and other rewarding benefits!